Going on a day hike is a great way to spend an afternoon and enjoy the outdoors with friends and family! On our previous hiking trip, we camped, but went on day hikes every day! We had to be prepared for the cold mornings, sunny afternoons and midday rains. Having the right gear helped us stay hydrated and warm for the whole week! This day hike packing list is an easy way to check off everything you need before your trip. To decide what you need to bring on your day hike, think about how far you are going, where you are located and the weather forecast for the day. 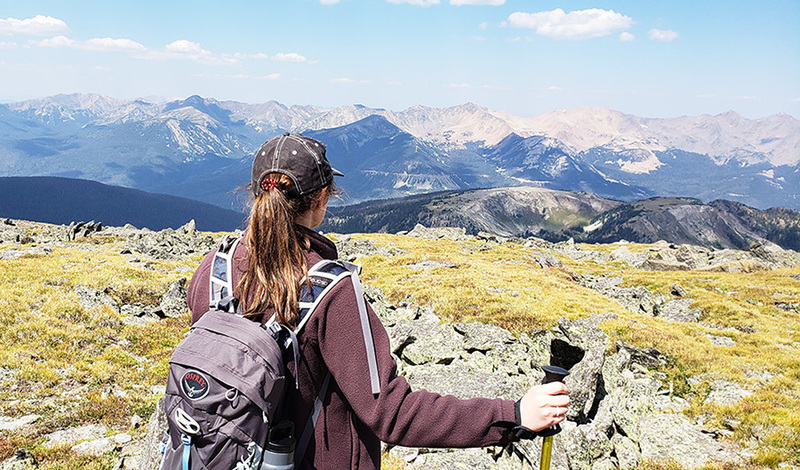 If you’re just getting into hiking, be sure to read these tips before your trip. Once you have selected your trail, get the map of the area and read some reviews. There are so many online resources available. Find out if the trail is a loop, or if you’ll have to backtrack or get a shuttle or a second car. On our recent trip to the Rockies, there was a great shuttle system, so there was no problem taking one-way trails, but make sure to check all of the details. Also, note any intersecting trails that could lead you off-trail. Reed more of my reviews, stories and blog posts about the Rocky Mountains here. Check the forecast before you go, this will give you information on how to dress and what to take with. If the weather is rainy, having a rain jacket and staying off exposed high altitudes will keep you safe on your hike! Painful feet can ruin a hike, so invest in high-quality hiking shoes and socks. You don’t have to have heavy boots, just make sure they are comfortable, waterproof and have good ankle support. Also go for wool or synthetic socks and pack moleskin just in case. Once your feet are ready to go, make sure to dress right. I recommend using synthetic clothing to avoid sweating and chafing. To be ready for any temperature (you may get hot while you are hiking in the sun) and the weather, wear layers that you can add or take off if you need. On my hiking trips I usually wear one light jacket to save me from wind and rain. Yes, take all of the necessities and be ready for anything, but don’t over-pack. Always take water on your hike, even more than you would normally need. Try to avoid packing bulky stuff, like a huge tube of sunscreen or huge camera. Camping Tip: If you are planning to go camping, check out my camping list, since you will need to remember and pack a lot more to plan for lunches, all of the hikes and relaxing evenings around the campfire! Hiking Boots – good hiking boots are very important for you to be safe on your hike. Make sure your hiking boots have good ankle support and are water-resistant. Rain jacket – it can rain any moment on your trip, especially if you are in the mountains, a lightweight rain jacket is a must! Long Underwear – here is a good pair for a winter hike. Depending on your hike difficulty and length, you might not need everything on this list. However, some things are good to have regardless of how far you are going. Water – it is always important to bring water with you on a hike. Wherever you go, but especially on higher elevation, always bring plenty of water! That’s about everything you should need on a day hike! Feel free to add other things you may need to your list and print it out! To download a Day Hike Packing List in pdf, sign up for my mailing list, and it will be sent straight to your inbox! Love these lists! Exactly the type of things I take with me on hikes.